SEOUL, South Korea — South Korea is pushing the U.S. to postpone joint military exercises until after the Winter Olympics as an olive branch to North Korea, a move the administration is considering, the South's president told NBC News on Tuesday. President Moon Jae-in said in an exclusive interview that drills could be pushed back if Pyongyang also shows willingness to pause its nuclear and missile tests before the Games in February. "If North Korea stops its provocations leading up to the Pyeongchang Olympics, it will greatly help in holding a safe Olympics," he said. "Also, it will help in creating conducive atmosphere towards inter-Korean as well as U.S.-North Korean dialogue." The 2018 Winter Olympics will take place in Pyeongchang, 110 miles east of Seoul, between Feb. 9 and Feb. 15, followed by the Paralympics from March 8 to March 18. "It is possible for South Korea and the U.S. to review the possibility of postponing the drill," Moon said. "I have made such suggestion to the U.S. and the U.S is currently reviewing." "It all this depends on how North Korea behaves," he added. 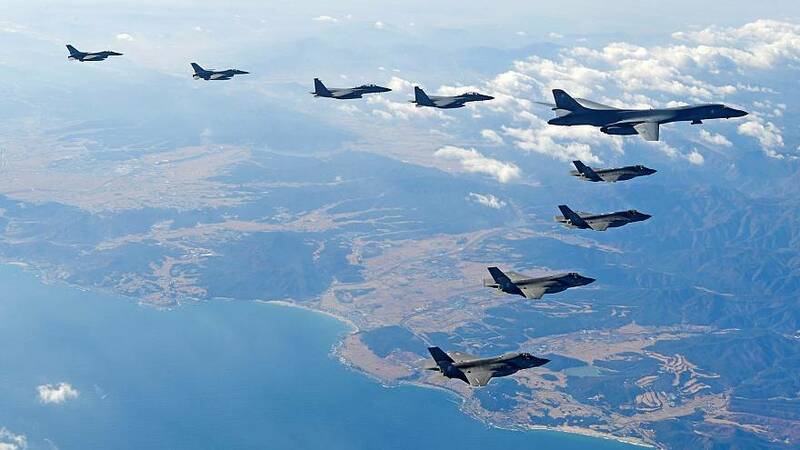 The U.S. and South Korea hold frequent military exercises to test their readiness should a conflict break out with North Korea. The biggest exercises are held each spring — known as Key Resolve and Foal Eagle — involving about 17,000 U.S. troops and more than 300,000 South Koreans. In November, South Korea's Yonhap news agency reported that the country was considering postponing the drills. Ensuring that the Games take place without interruption from North Korea is a primary concern for the South. It has invested heavily in infrastructure, building a high-speed train from the Seoul airport to the Olympics site at a cost of $3.7 billion. The interview with NBC News was conducted aboard the train. It has also bolstered security for the event. Seoul plans to deploy around 5,000 troops, double the number at the 2002 World Cup. It has ratcheted up cyber security to ward off hacking attempts. Moon sought to allay any fears Tuesday, telling NBC News that "there's no reason to be concerned about the safety and as the president of the Republic of Korea I assure you that." He added: "I hope that this Olympics will be able to promote the peace between the North and South Korea and become an Olympics for peace." Ticket sales have been disappointing in the lead up to the Games, with only a third of the 1.1 million available sold as of mid-November. Nearly 80 percent of the tickets allocated to South Koreans were still available. This year, North Korean leader Kim Jong Un conducted his most powerful nuclear test to date, as well as his first three intercontinental ballistic missile launches — the last of which Pyongyang claimed could reach anywhere in the U.S.
For a moment it appeared that security concerns might keep athletes away. Nikki Haley, the U.S. ambassador to the U.N., indicated that participation by American athletes was undecided, calling it an "open question." Soon after the White House stated that U.S. athletes would attend. Moon downplayed concerns about Olympics security in the interview with NBC News and expressed his wish to see North Korea participate. It remains unclear whether any North Korean athletes will do so, though two figure skaters have qualified. Moon assumed the presidency in May, after a bribery scandal felled his predecessor, Park Geun-hye. The left-leaning president has emerged as a levelheaded pragmatist, despite heated sparring and mounting nuclear tensions between the U.S. and North Korea in recent months. Elected on a promise to engage in dialogue with North Korea, his first few months in office have been eventful ones. He quickly found himself at odds with the Trump administration's more hawkish approach toward the North. He has also faced trade-related criticism from Trump, who complains bitterly of the U.S. trade deficit with South Korea. Trump has responded to North Korea's missile and nuclear tests by threatening to reign "fire and fury" and to "totally destroy" the country. Moon has taken a different tack, ruling out any offensive military action as "unthinkable," an approach Trump called "appeasement" on Twitter. Though Trump has disparaged negotiations with the North as "wasting time," he seemed to put more faith in dialogue after a November visit to South Korea. Kim would do best to "come to the table and to make a deal," he said. Relations warmed between Moon and Trump after that visit.